A gorgeous arch mirror featuring branches and songbirds. The realistically detailed frame of this arch wall mirror features tree branches encircling the glistening glass as songbirds stop in for a rest. The antiqued gold finish is distressed and glazed in an earthy gray. From Uttermost. 26" wide x 37" high x 2" deep. Hang weight is 30 lbs. Glass only section is 22" wide x 34 1/2" high. Surrounding frame is 1 1/2" wide. A rustic arch-top mirror designed by Grace Feyock for Uttermost. Antiqued gold leaf finish. Earthy gray over-glaze finish. Resin frame construction. Arch frame with decorative songbirds. I ordered it for my daughter and loved it so much I wanted one too! Simply elegant and will be the perfect compliment to the new bathroom I'm staging for a home to soon be on the market! 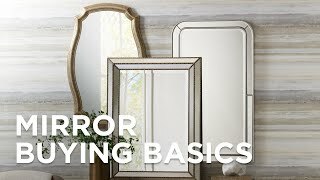 What is the mounts like on the back of th mirror? I’m concerned about the weight as I’m going to hang on a tiled powder room wall. BEST ANSWER: All mounting hardware is included with the "D" rings attached to the back for hanging. Delivery was good, just realize it is very heavy. Bring a classical touch to your sophisticated home with this rectangular wall mirror in a plated oxidized gold metal frame.